FR 126b "Liberty w/ Sword" P.C.G.S. 35 ~ RARE Only 59 Pieces Graded! FR 126b "LIBERTY WITH SWORD AND SHIELD" 1862 $20 U.S. LEGAL TENDER GRADED PCGS 35 VERY FINE! FULL MARGINS appear on this very rare piece, which is not typical. Also, nice sharp corners and nice Red Seal and serial #'s. 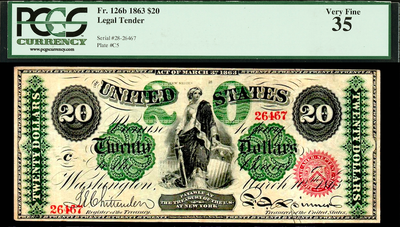 To find a $20 Legal Tender from during the Civil War is not an easy task. This Liberty with Shield / Sword is prohibitly expensive in higher grades (I've seen many sell for in the $30k's) and still not have the nicely centered margins this piece has. These pieces of course were HAND CUT in during the war there wasn't a lot of time to be concerned with margins, lol, thus, most are all cut "into the design." This piece has had very very minor professional conservation, although not evident or even found with the naked eye. 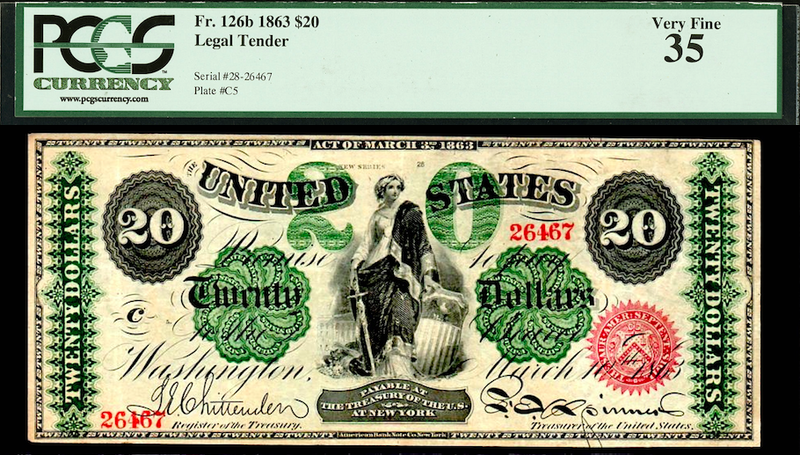 Very few collectors, heck, even dealers, have ever had the pleasure of owning a Civil War $20 bill – here's a chance at an affordable price.